My brother bought several copies of my book for our siblings. He also sent a picture of them. I thought it was a beautiful sight. He wants me to sign them and send them to him and our siblings. If anyone of you want a signed copy, go ahead and send it to me, with enough postage to return it, and I'll do that for you. With the Christmas season underway, I haven't had much opportunity to write or even do some marketing. But while I can't prove it, I have the feeling my book selling well anyway. If you want a laugh, I still haven't got a copy of Bridgetown High! In fact, I never saw a copy until a sister in my church brought it to church to let me see it. My wife says she'll buy a copy after Christmas. This past year has been exciting, especially ever since Limitless Publishing published my novel. Thanks to all of you too, for making this adventure possible. In case I don't get a chance to write in here until after Christmas, I want to wish you all a very happy and merry Christmas and New Year. A great big "Hi" to all my faithful followers. I hope your Thanksgiving was warm and wonderful. Feel free to tell us all about it in the comment section below. As for me and my wife, we had a great week, visiting with my sweet daughter and her family in south-central California, not far from the Pacific Ocean. The coast was breath taking with blue ocean water, bright sunshine, and green and brown on the hills and Coast Range. I didn't get a chance to write or do any marketing, but that's OK. It gave me some time to relax, reflect on my progress as a published author, and reflect on my many Heaven-sent blessings and my role as a Son of God. I know, I haven't said much about my religious beliefs and I don't intend to here, but let it be said (written) I believe in Christ, the Son of God. Just one house keeping note here. 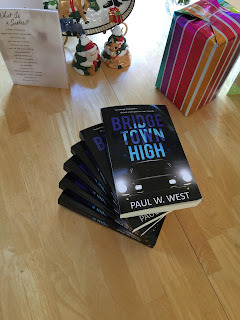 Beginning Thursday, December 2, 3, and 4, 2015, my publisher "Limitless Publishing" will be conducted what they call a "Blog Tour" in behalf of my novel, "Bridgetown High." I have little idea of how it works, and I will only be able to follow along on Thursday during my breaks at work. I think this site may be a place to follow them -- I don't really know. Or, perhaps clicking on the Limitless web page will get you there. I hope I figure it out as I'd love to see what kinds of comments bloggers give. On a humerus note. Two weeks ago, when I went to church, a lady in our Ward brought a copy of my novel and let me see it. WOW! Get this! That was the first copy of my novel I'd seen. When I got to my daughter's house I saw her copy too, so that makes two copies I've seen now. Until the next time I write in this blog, I wish you all a wonderful day and week. Please let me know what you would like me to blog about. I'm thinking of helping you to write and publish your own works. Are you interested in that? That's two things you can comment on, or anything else you would like to say.